At CBD School, we love our pets. We’ve had quite a few dogs in our day…and the 3-year-old siblings we have now are pretty much the best dogs ever. They’re part of our family, which is we’re adamant about keeping them healthy and happy. As you can probably imagine, they’ve both tried a few different CBD brands in their day. CBD works for animals much the same way it does for humans, and there’s actually an increasing number of pet owners out there that use CBD for pets. (To learn more about using CBD oil for dogs, check out our CBD Oil for Dogs: Beginner’s Guide with FAQs). 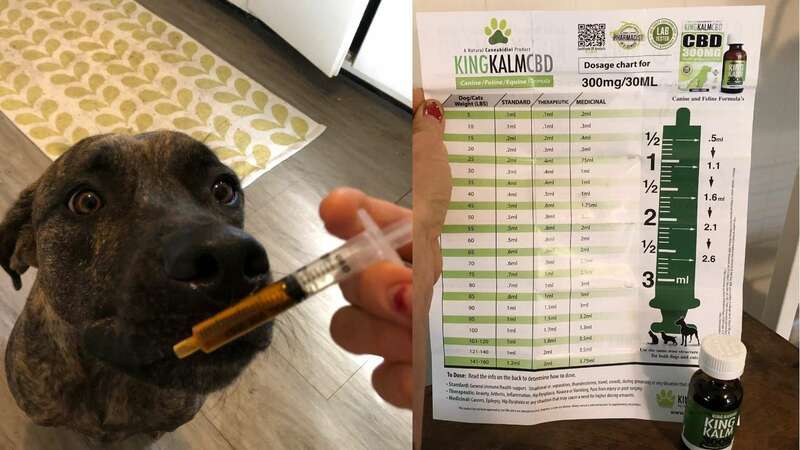 We’re always looking to try new CBD products and couldn’t wait to see how our pups personally took to King Kanine. First, a little about the company itself. King Kanine didn’t start out as a CBD company. It started in 2015 with a de-shedding tool…an old method of deshedding turned into a user-friendly dog brush designed with King Kanine’s founder, Jeff Riman’s beloved Great Danes in minds. Riman says the company evolved naturally on its own from there. After the success of the King Komb (which is now sold in 44 countries), a natural shampoo followed (King Klean), and in early 2016 the development of CBD products for dogs basically fell into Riman’s lap. CBD was part of the natural evolution of the King Kanine, and the products the produce are telling of their true commitment to quality. Want to learn even more about what goes on behind the scenes at King Kanine? Listen in to the CBD School Podcast episode with founder, Jeff Riman. King Kanine is a company crazy about animals. After our recent podcast with Jeff and trying a couple of their products on our own pets, we can honestly say they’re doing a fine job of what they set out to do. Aside from a commitment to quality, natural pet products they’re adamant about keeping pet owners educated and informed with various resources and info to make sure their pets are happy and healthy. Their website contains a couple pages of blog posts full of all the information pet owners need to make an informed decision about using CBD for their animals. Learn how CBD can help your senior dog, stay updated on current research on CBD for pets, and listen to personal pet accounts on how CBD worked for them. King Kanine loves to see pets and their owners out together, which is why they organize and take part in various events (like puppy brunches and dog group walks through the park) with that sole purpose in mind. King Kanine is also a business ambassador of the American Society for the Prevention of Cruelty to Animals (ASPCA). 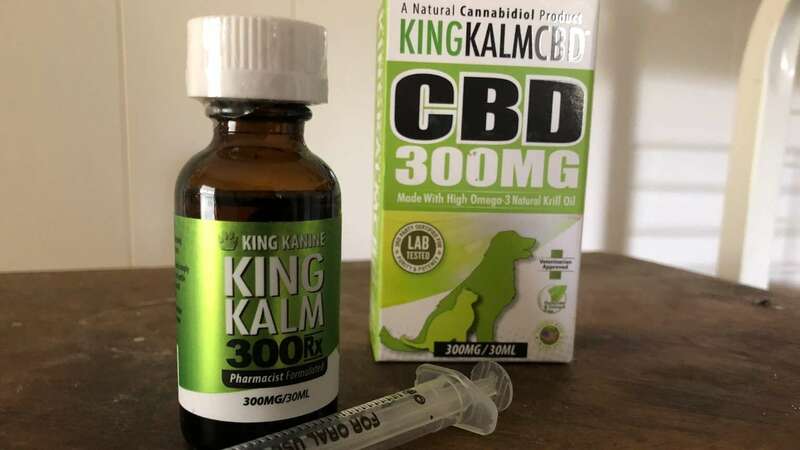 In a company so dedicated to dogs and the wellbeing of animals, you’d expect King Kanine would ensure they’re putting out the highest quality CBD products you can find. This is exactly their intention. King Kanine has an extensive list of pet products aside from their line of high-quality CBD. If you aren’t familiar with their products and you have dogs (or cats or horses!! ), you might want to check out their grooming products. 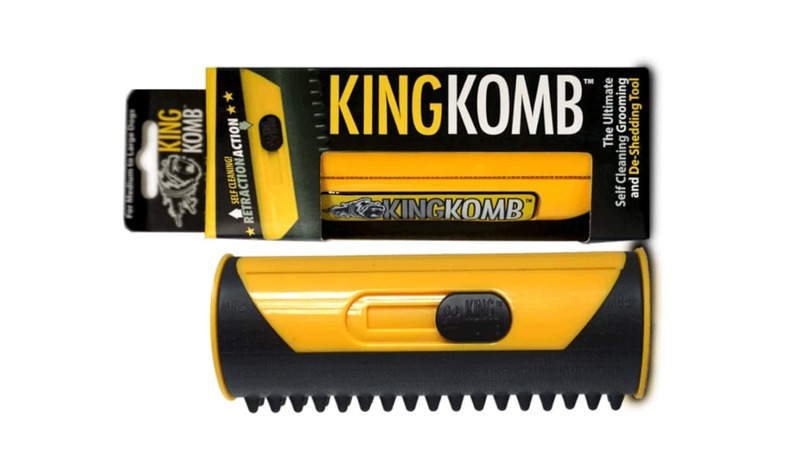 The King Komb (their claim to fame) that was developed in 2015 is now sold in over 44 countries, after all. 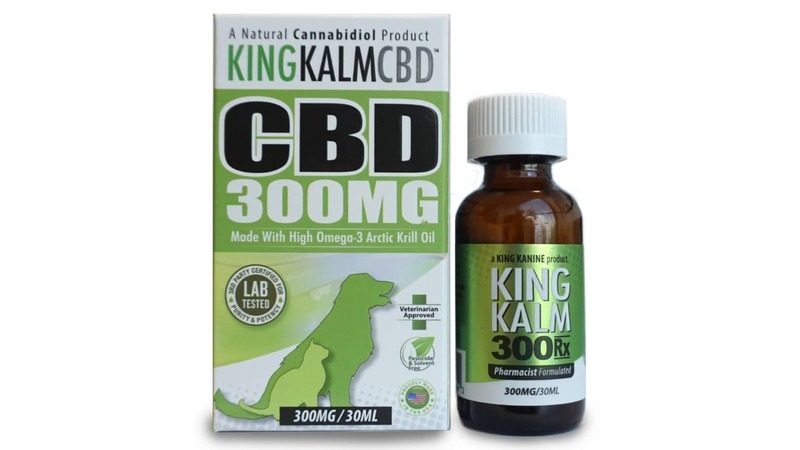 King Kalm CBD ($39.99, $59.99, $89.99): A tincture made with two ingredients: Phytocannabinoid-rich, broad spectrum CBD oil and High Omega-3 Krill Oil, available in 75mg, 150mg, and 300mg sizes. 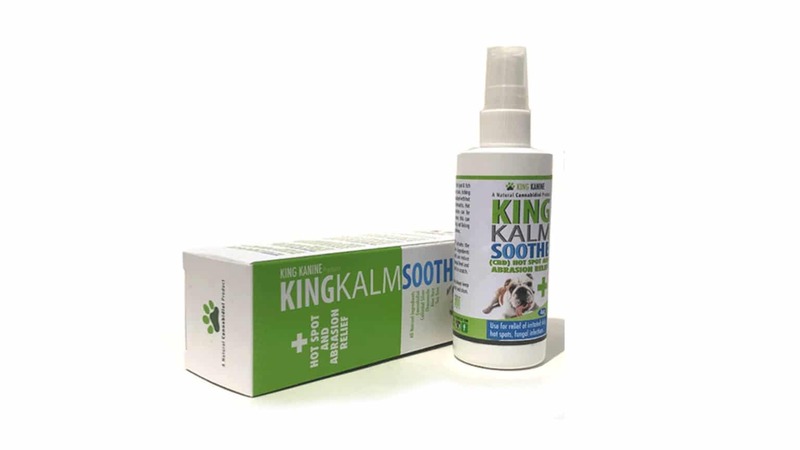 King Kalm Soothe ($19.99): CBD topical spray with added natural ingredients like aloe and tea tree oil that are beneficial for treating inflammation, irritated skin, and hot spots that lead to scratching or licking of the affected area. 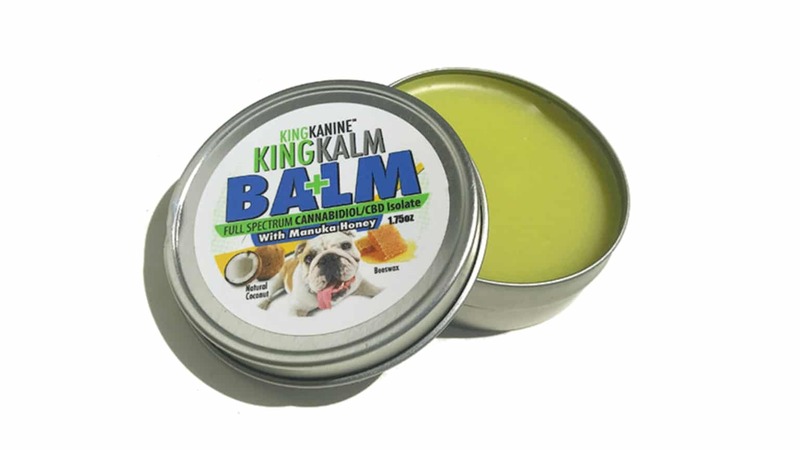 King Kalm Balm ($16.99): A topical balm made with CBD, beeswax, coconut oil, and Manuka honey that’s designed for paws to keep moisture away from skin in wet, rainy, and cold situations. It’s also intended to aid in moisturizing dry paws, noses, and elbows. 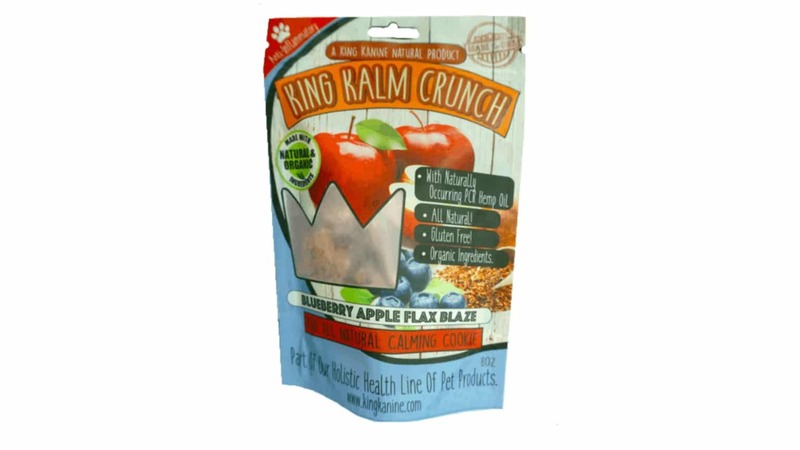 King Kalm Krunch ($34.99): All-natural dog treats formulated with 3-5mg CBD each. Flavors include Apple Cinnamon, Blueberry, and Honey Oat. Because King Kanine CBD products are made with full-spectrum cannabidiol, there are trace amounts of THC in their products (0.3% or less). They aren’t psychoactive at all, however…and won’t get your dog high. We tried both the King Kalm Krunch (in Apple Cinnamon) and the King Kalm CBD (in 300mg). 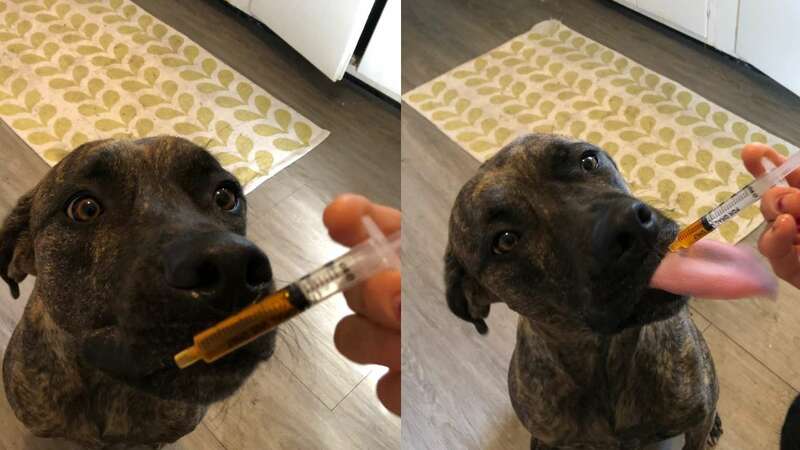 Our female dog is a little more than halfway through recovering from ACL surgery and we’ve been giving her CBD since. 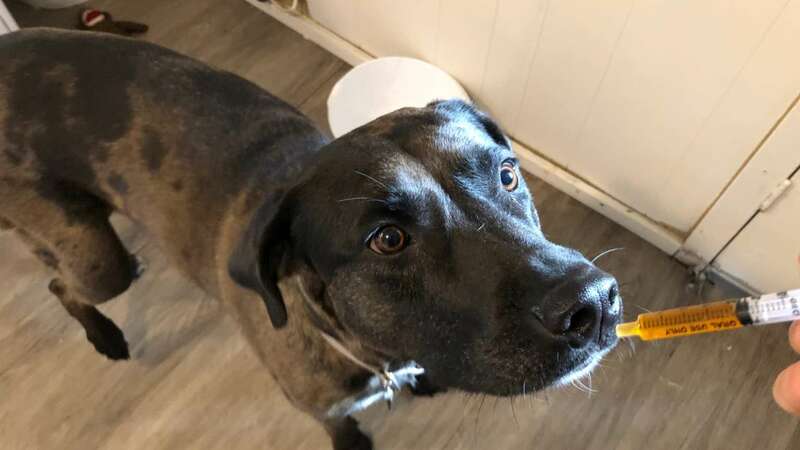 We dosed her per King Kanine’s easy-to-understand dosing recommendations (included in the box with every purchase as well as on their website) and noticed she seemed to feel much better after taking it (using the leg more and less limping). Our male dog is a bit needy (to say the least) and the King Kanine CBD seemed to calm him down and help him relax a bit. Both dogs loved the King Kalm Krunch (something we tried a bite of personally since they’re made with all-natural, human-grade ingredients…and found them to taste just like a really healthy, crunchy human cookie). Was it just because they love treats or because they love these treats in particular? Tough to say, but we’ll definitely keep using them. Something we’re really adamant about at CBD School is quality CBD that stands up to its claims. In such an unregulated industry, it can be difficult to tell who’s legit and who’s selling snake oil. In a market that is still so unregulated where anything can go, it’s vital that the CBD products you purchase (for you or your pets) are third-party tested for quality. In step King Kanine’s commitment to testing their products. After talking to Riman on our recent podcast and exploring their products and website, third-party testing is something that seems like it’s as important to them as it is to us at CBD School. What’s more is that they’ve made it extremely easy to find their lab results on their website. 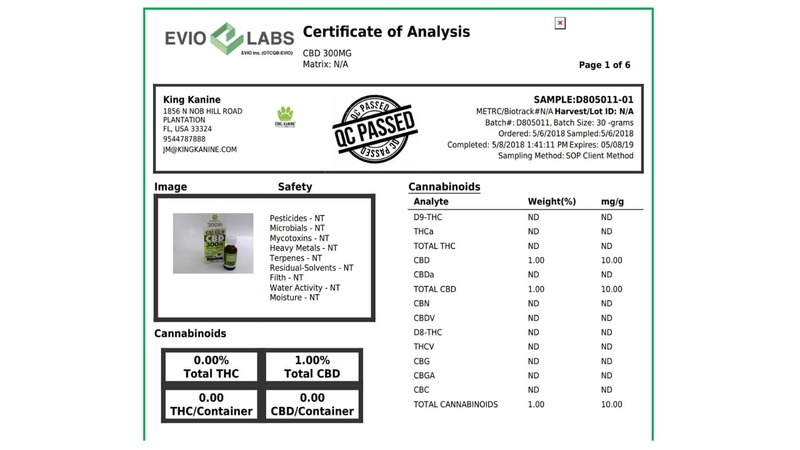 Each and every batch they make is tested at an ISO 17025 certified laboratory not just for CBD content, but included full panel tests that check for microbiology, pesticides, mycotoxin, heavy metals, and residual solvents. What this means is that you know exactly what your furry friends are getting in each and every King Kanine CBD product that’s produced. 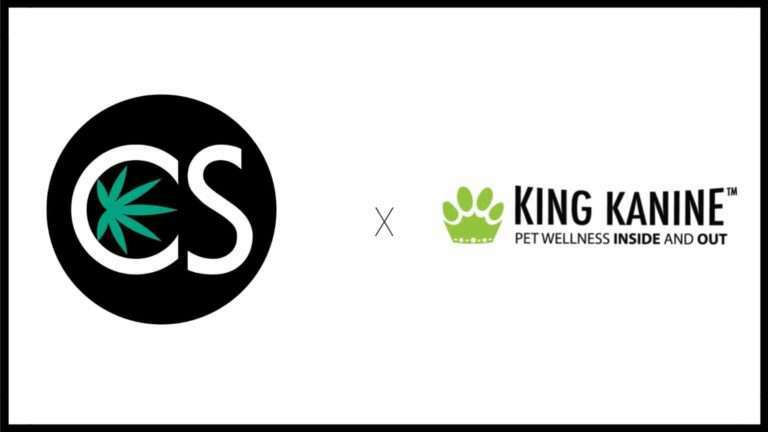 If you’ve got dogs and you want to give them CBD, King Kanine is a reputable company that truly seems to care about the products they produce and the pets they produce them for. The only drawback we can see is the price. King Kanine CBD products aren’t cheap…but they are quality, and they won’t necessarily break the bank. Their website does mention, however, that they’re always doing discounts, contests, and giveaways on their Facebook and Instagram pages. Something worth checking out. Would we use King Kanine products again? Yes. Would we recommend them to our friends with dogs? Absolutely. Our dogs loved their products, and thanks to third-party results that were easy to find on their website, we knew we were giving our pups a quality product we could trust.